With rising landfill tipping fees, many Iowa schools are looking for an alternative to tossing their food waste in the trash. One way gaining popularity is through composting. It diverts food waste from the landfill and can save hundreds of dollars. Don’t think it can be done? Check out Central Community School in Elkader. Located in Clayton County, Central Community’s K-12 school composts all of the food waste generated by the students, faculty and staff. Without a landfill, Clayton County businesses are forced to send their trash to a neighboring county which can get expensive. Composting has allowed Central to decrease their lunchtime waste by nearly 60%, which has saved money and allowed students to learn the benefits of sustainable living. The compost operation at Central is maintained by students who recently realized the waste was not breaking down. IWRC Environmental Specialist, Jenny Trent, was able to visit their site to see what was going on. ”The internal temperature of the compost was too low which restricted breakdown of the waste,” explains Trent. The compost piles were too small to generate heat but were also located near the Turkey River. She was able to provide solutions and suggestions for carbon to nitrogen ratios, pile size, and regulations that apply to composting near a water source. This information led two seniors and three juniors from Central to meet with both the Elkader City Council and the Clayton County Board of Supervisors to obtain permission to compost the school’s food waste at the local yard waste burn site with plenty of space between the river and the compost pile. With permission from both, the high schoolers are planning on moving the pile. They have also secured a spreader in which food waste will be layered with carbon sources, driven to the new site and deposited. The spreader will help mix the material. 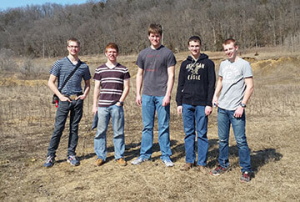 The students working on this project pictured from left to right are Tom Shirbroun, Jacob Jansen, Ben Whittle, Brandon Hach, and Blake Rochleau. We can help! Below is a detailed list of what we can provide to your Iowa school. Large or small, we can help you divert your food waste. The schools themselves play an important role in ensuring the success of the composting efforts. If you’re serious about reducing your school’s food waste, Trent suggests three main steps. Decide if you’ll be reducing post-consumer food waste or kitchen waste. Find out how much food waste they generate. Identify a passionate individual, such as a teacher or custodial worker, who’s willing to lead the project, get students involved, and assist in the maintenance of the compost pile. If you’re interested in starting your own school composting pile or have a question about an existing process, check out our website for composting resources or give Jenny at a call at 319-273-6584. Central Community School in Elkader is also willing to assist schools in starting their own composting operation. For assistance, contact Ann Gritzner at .